'I believe the overwhelming view of the Republican Conference of the Senate in the Senate is that this nomination should not be filled, this vacancy should not be filled by this lame duck president,' Senate Majority Leader McConnell said Tuesday. Any doubt that Senate Republicans would hold the line behind their leader&apos;s decision to block President Obama&apos;s Supreme Court nominee has been erased. "I can now confidently say the view shared by virtually everybody in my conference, is that the nomination should be made by the president the people elect in the election that&apos;s underway right now," Senate Majority Leader Mitch McConnell, R-Ky., told reporters. Senate Republicans on Tuesday held their first closed-door meeting since the unexpected death of Justice Antonin Scalia to discuss the party&apos;s strategy going forward. "I believe the overwhelming view of the Republican Conference of the Senate in the Senate is that this nomination should not be filled, this vacancy should not be filled by this lame duck president," McConnell added. Just two Republicans — Susan Collins of Maine and Mark Kirk of Illinois — have voiced skepticism of McConnell&apos;s strategy. Collins is known for her independent streak and Kirk is running in a tough re-election battle in Obama&apos;s home state. Further bolstering McConnell&apos;s decision was a Tuesday announcement by all 11 Republicans on the Senate Judiciary Committee, led by Chairman Charles Grassley, R-Iowa, that the panel would not move forward with any consideration of Obama&apos;s nominee. Top Republicans including McConnell, Senate Majority Whip John Cornyn of Texas, and Sen. Orrin Hatch, R-Utah, also told reporters they would not meet one-on-one with Obama&apos;s nominee, a long-established Senate custom in the confirmation process. "I don&apos;t see the point of going through the motions if we know what the outcome is going to be, and we are united on that," Cornyn said. 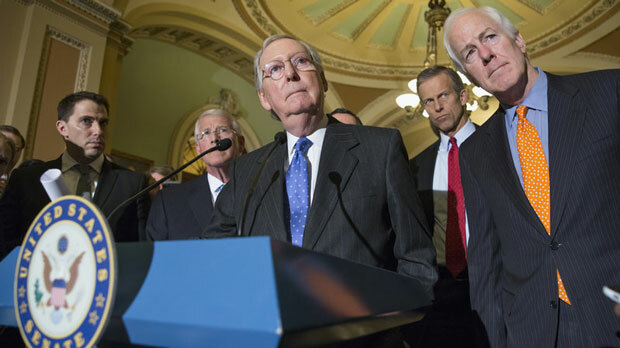 Republicans brushed off Democratic accusations of obstruction as hypocritical. A widely circulated 1992 video of then-Sen. Joe Biden, who sat atop the Judiciary Committee, showed him giving an impassioned Senate floor speech defending the Senate&apos;s right to block a nominee amid a heated presidential election. "It is my view that if a Supreme Court justice resigns tomorrow, or within the next several weeks, or resigns at the end of the summer, President [George H.W.] Bush should consider following the practice of a majority of his predecessors and not — and not — name a nominee until after the November election is completed," Biden said in 1992. "We know what would happen if the shoe was on the other foot. We know what would happen," McConnell said Tuesday, "A nominee of a Republican president would not be confirmed by a Democratic Senate when the vacancy was created in a presidential election year. That&apos;s a fact." Senate Minority Leader Harry Reid, D-Nev., predicted McConnell would ultimately back down. "He hasn&apos;t seen the pressure that&apos;s going to build. It&apos;s going to build in all facets of the political constituency in the country," Reid told reporters. Sen. Charles Schumer, D-N.Y., whose past remarks on blocking Supreme Court judges have also been used as fodder by Republicans, said the partisan bickering is a sideshow to the underlying fight over Obama&apos;s ability to get his nominee approved. "The public doesn&apos;t care about that, they care about us doing our job, plain and simple," he said, "All this back-and-forth of quotes from years ago which didn&apos;t hold anything up don&apos;t make a darn bit of difference to the public." Senate opposition has not deterred the president, who intends to send a nomination to the Senate in the coming weeks. Obama has been making calls to Capitol Hill in recent days, asking senators for their input and support.